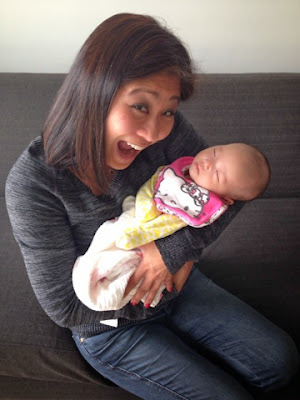 my dear friend weezermonkey is a mommy! 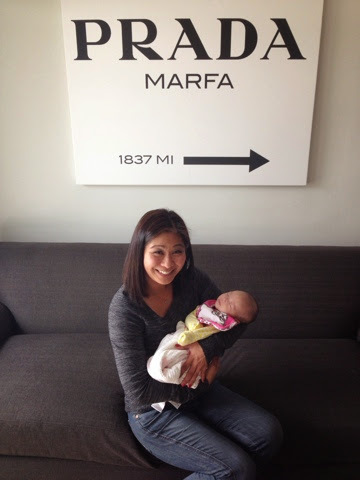 i was so excited when we were finally able to coordinate schedules so that i could stop in to meet her adorable baby girl. with our friend and OG SFAM trish free to come in on her lunch break, it turned into a really fun GTG. watching the monkey in action as she tackles the craziness of new motherhood was sweet and wonderful and awesome. plus, i totally got a kick out of seeing all of the baby paraphernalia around her fabulous home. we talked and laughed and ate lunch while baby monkey slept peacefully, and even got to hang out with mr. monkey for a bit. a little closer - look at how beautiful this little doll is! oh, how i miss that precious new baby smell. and it seemed like forever ago since the bean (and the teen) was that small. there is nothing like cradling a newborn in your arms, and i had to squelch the urge to just cover her little head with kisses. i'm just so happy for my friends! they're going to be such awesome parents, and baby monkey is one lucky little girl. Such a sweet little pkg.